Night On Earth is a Jim Jarmusch film from 1991. It’s actually five shorts, each centred around a passenger taking a ride in a cab. We start off in Los Angeles in the evening (with Winona Ryder) and work our way through to New York, Paris (Beatrice Dalle), Rome with the film ending with the sun rising in Helsinki. It’s a quirky, slight offering from Jarmusch, but enjoyable nonetheless. What is rather special, is the soundtrack to the movie. It’s an entirely original collection of tracks (mainly instrumental) recorded by Tom Waits, and written by Waits and Kathleen Brennan (his wife). The album starts with the main theme song for the film Back In The Good Old World (Gypsy). It’s a memorable track with the instrumentation very much in the vein of Bone Machine and Rain Dogs. Quirky percussion and his idiosyncratic, ramshackle backing are set off against a lovely melody and lyric about a man yearning for days of old: “Oh but summer is gone / I remember it best / Back in the good old world”. Themes and melodies from Back In The Good Old World thread their way through the 16 tracks on the record, but change appropriately, according to where we are in the world (and the movie). So for Los Angeles Mood and Los Angeles Theme we get lead electric guitars, while for the New York Theme we get a jazzy horn and piano affair. Despite all the changes in moods, every piece of music has Waits’ fingerprints all over it. Very distinctive. Some slinky sax arrives promptly in Paris, for Ms Dalle (Baby I’m Not A Baby Anymore (Beatrice Theme)) and shortly after, we get another vocal track, the very Parisian On The Other Side Of The World. By the time the film reaches Helsinki we are rewarded with another vocal version of the main theme The Good Old World (Waltz). As the title indicates this is a waltz, slowed down somewhat, but sung movingly by Tom Waits. A final instrumental version of the recurrent theme brings us to the end of this wonderfully sentimental and romantic soundtrack album. You don’t really need to have seen the film to enjoy this music, and those put off by Waits’ more experimental leanings can be reassured that although it’s very quirky, there is nothing here so abrasive that it has you reaching to skip forward. 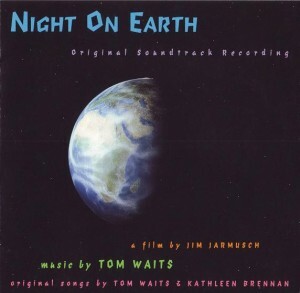 At this point you might be wondering why the Night On Earth Soundtrack is on the reissue wish list? That’s easy. It’s 20 years old in 2012, and it has been out-of-print for a very long time. I think I’m right in saying that it’s the only Tom Waits album that is not currently in print. So for a change, I’m not looking for a multi-disc expanded reissue, let’s just have this lovely music re-released and back, as an affordable single CD reissue (prices are very expensive on the used market). WHY REISSUE? : The only Tom Waits album currently out of print. Nice write-up on this. I had this album on my “check it out” list and your review is very informative. Are you familiar with his other soundtrack album (totally underrated – a real gem. Can’t think of the name offhand. I have it on LP). Hope someone has posted this somewhere. title of other soundtrack is ” One from the heart ” ; wonderful album ( duets with Crystal Gayle sublime ) ; movie bit of a turkey and brought down Coppola’s Zoetrope studio !! Thanks for the final specs. I’ve just cancelled mine on Amazon. No 5.1 audio is bad enough, but no blu-ray or hi-res audio at all? I’m not going to pay $100 for the few pieces I don’t already have. I’ll have to forego completing my immersion sets and just get the experience set this time.